Does Drinking More Water Preserve Kidney Function? 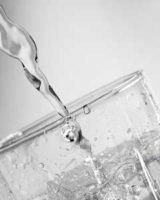 Response: This study is about the use of increased water intake in people with chronic kidney disease (CKD). Although there are a large number of benefits claimed most are not substantiated by evidence. However there is a growing body of evidence (animal and human observational studies) that increased hydration with the suppression of antidiuretic hormone preserves kidney function in CKD. This led to our current randomised clinical trial of 631 patients with stage 3 CKD and proteinuria to determine if drinking an extra 4-6 glasses of water per day for 1 year would slow their progressive loss of kidney function as measured by eGFR. The main findings were that those coached to increase their water intake versus those coached to sustain their normal fluid intake suffered no ill effects from the intervention and on average were able to sustain an average increase of approximately 3 glasses of water per day. At the end of 1 year the increased hydration group had suppressed their antidiuretic hormone levels (copeptin) significantly but did not demonstrate a greater preservation in their eGFR. Response: At present coaching to increase hydration does not show preservation in kidney function in patients with stage 3 CKD and proteinuria. Response: We have completed phase 1 of the hydration study and will be completing a further year in June to see if the effect is time dependent. We encourage a focus on low water drinkers to see if this subgroup will show the increased hydration benefit noted by prior observational studies (study just initiated by Dr Olle Melander in Sweden). This is the first step in defining the potential therapeutic role of increased hydration in slowing kidney decline in CKD. This entry was posted in Author Interviews, JAMA, Kidney Disease and tagged CKD, kidney, kidney disease, water by Marie Benz MD FAAD. Bookmark the permalink. In chronic renal failure, according to our studies since 1984, there is only one reason – hypertension, and hypertension is due to excess intake of SOLI. For details, see How to Prevent Caries, Hypertension, Ulcer, Cancer, Angiosarcoma. For the treatment of chronic renal failure, it is necessary to reduce the intake of SALT.